The present effort involved isolation and screening of bacterial strain Bacillus sp. ISTC1 for production of PHA and optimization of selected process parameters for enhanced production of PHA and biomass. Screening of selected bacterial strain for PHA production was based on Nile red staining, fluorescence microscopic visualization, spectrofluorometric measurement of Nile red fluorescence of the bacterial culture having 0.5% (w/v) glucose as carbon source. The presence of 3-hydroxyvalerate revealed by GC–MS served as a confirmatory analysis of PHA accumulation. Detection of characteristic functional group by FT-IR further confirmed the production of PHA by the bacterium. Response Surface Methodology (RSM) was used for optimization of pH, time duration and carbon source concentrations for an increased PHA production. On equating the optimized condition with the pre-optimized one, there was almost a 60% increase in the production of PHA. Therefore the finding thus established the production of PHA by Bacillus sp. ISTC1. As we all know because of human intervention, world is welcoming us with so many bizarre complications but apart from these our human race is creating a bigger mess in terms of the plastic industry. With continuous growth for more than 50 years, global plastic production in 2012 rose to 288 million tonnes-a 2.8% increase compared to 2011 and situation wasn’t better at all for the year 2013. It has been continuously rising with almost 299 million tons of plastics produced in 2013 which was 3.9% higher than 2012’s output and is expected to further increase at an alarming rate in the near future. A fortunate advantage with, such biopolymers that exhibit alike physical and mechanical properties to oil-based plastics. There are certain bacterial species having natural accumulation capacity within their cells. Therefore, one of the long-term and cost effective strategy to culturing such type of microbes which can accumulate and produced easily degradable biopolymers which ultimately will help us in controlling this flooding situation of plastic industry. Polyhydroxyalkanoates (PHAs) are biodegradable, biocompatible and thermostable biopolymers that are synthesized by several bacteria as reserve food materials as source of energy  usually in the presence of growth limiting nutrient condition. Structurally, they are polyesters, which contain (R)-hydroxyacyl monomeric units. PHA can be synthesized as homopolymers or copolymers or even their mixture based on the selected bacterial strain and supply of growth substrates. Among the nearly 150 different PHA monomers identified till now, Poly (3-hydroxybutyrate) (PHB), a short chain length PHA (scl-PHA) having 3 to 5 carbon atom, is the first and perfectly-characterized form. Other forms, commonly synthesized by microbes are medium chain length PHAs (mcl-PHA) having 6 to 14 carbon atom like poly-b-hydroxyvalerate (PHV), poly (3-hydroxyhexanoate) (PHH), poly (3-hydro-xyoctanoate) (PHO)  and copolymers like Poly (3-hydroxybutyrate-co- 3-hydroxyvalerate) (PHBV) and poly (β 3-hydroxybutyrate-co-3hydroxyhexanoate) (PHBHHx) , long-chain length PHA (lcl-PHA) containing 15 or more carbon atoms or copolymer of scl-mcl PHA copolymer consisting of monomeric subunits with 4 to12 carbons . Both Gram positive and Gram negative bacteria have been known to produce PHA but the synthesis pathway may be different such as an enoyl-CoA hydratase, Methyl malonyl-CoA pathway for PHBV synthesis from sugars represented by Ralstonia eutropha, from fatty acids or carbohydrates as represented by the Pseudomonads. Alcaligenes latus, Azotobacter vinelandii, Serratia spp.,Bacillus spp., are some other commercially important strains for PHA production. The global bioplastics market is projected to reach 5.8 billion US dollars in 2021. However, its high Production cost is the major constraint to the growing PHA market. Hence, there is a need to search low cost sustainable alternatives along with optimization of process parameters for higher production of these biopolymers. In recent times, researchers in this field are more focussing on low cost carbon source for production along with optimization of process parameters to maximize production efficiency of these biopolymers [5,6]. One of the many statistical techniques’ used for optimization is Response Surface Methodology (RSM). Previous studies have reported the use of RSM for increased production of PHAs by different bacterial strains such as Bacillus coagulans, Rhodobacter sphaeroides, Serratia sp. and R. eutropha [7-9]. The objectives of this study were to isolate and screen bacterial strain Bacillus sp. ISTC1 for production, characterization and optimization of the process parameters using RSM for enhanced PHA and biomass production. Sample isolated from marble rocks of the palaeoproterozoic metasediments of the Aravali Super group, Rajasthan, India, was dissolved in autoclaved distilled water. Dissolved sample (1ml) was filter sterile and used as inoculums(1:10 v/v) in Minimal salt medium (MSM) containing (g.L−1): Na2HPO4•2H2O, 7.8; KH2PO4, 6.8; MgSO4, 0.2; NaNO3, 0.085; ZnSO4.7H2O, 0.05; ZnCl2, 0.02; Ca(NO3)22.4H2O, 0.05. The bacterial strain was cultured in MSM for 15 day at 30°C, 150 rpm and pH 7.5. The members of bacterial community obtained from MSM culture were spread on LB-agar plates. Morphologically distinct isolates were re-cultured separately in LB-medium and overnight culture of the strain was centrifuged (7000 rpm, 10 min) and the cell pellet transferred to mineral medium (MM) (pH 7.0)  containing (g.L-1 ): KH2PO4, 1.5; Na2HPO4,6.78; NaCl, 0.5; NH4 (CH3COO)3Fe, 0.06; 1 M MgSO4, 2 mL.L−1; 1 M CaCl2,0.1 mL.L−1; 1 mL.L−1 trace metal solution consisting of (g. L−1): ZnSO4, 0.1; H3BO3, 0.3; CuSO4, 0.006; NiCl2.6H2O, 0.020; Na2MoO4.2H2O, 0.030; MnCl2.2H2O, 0.25, supplemented with 0.5% Glucose as carbon sources and incubated under aerobic conditions at 30°C and 150 rpm and their growth pattern was determined on the basis of absorbance at A 595 nm by spectrophotometer Cary, 100 Bio (Varian Co., Australia). Bacterial genomic DNA was isolated with the Genome DNA Kit (Qiagen Inc., USA) as prescribe by the manufacturer. The 16S rRNA gene was amplified from genomic DNA by using PCR with universal primers 5′ GAGAGTTT GATCCTGGCTCAG-3′ (forward) and 5′-CTACGGCTACCTTGT-TACGA-3′ (reverse). PCR amplification was performed using primer with a DNA thermal cycler under the following conditions: 10-20 ng template DNA, 5 mL 10 reaction buffer, 2.5 U Taq DNA polymerase, 1 mM forward primer, 1 mM reverse primer, 200 mM of each dNTP and H2O combined in a total volume of 50 mL. The tubes were incubated at 94°C for 5 min and then subjected to the underneath thermal cycling program: denaturation at 94°C for 2 min, primer annealing at 55°C for 2 min, and chain extension at 72°C for 2 min with an additional extension time of 10 min on the final cycle, for a total of 30 cycles. The amplified DNA was purified using Qiaquick PCR Purification Kit (Qiagen Inc., USA), adjusted to 200 ng/mL and cloned in the pDrive (Qiagen Inc., USA) and sent to the SciGenom Labs Cochin, India, for sequencing. Sequenced data was compared and analyzed with the existing database of GenBank, National Center for Biotechnology Information. A phylogenetic tree was drawn on the basis of the sequences. A bootstrap consensus tree (1000 copies) was drawn by multiple sequence alignment with Neighbor Joining method using software Mega, version 6.1 with different species of bacteria . Fluorometric visualization: Fluorometric visualization of PHA accumulation was observed with Nile red test with slight modification . Briefly, 1 mL of the bacteria cultured at 30°C, 150 rpm in minimal medium with 0.5% Glucose carbon source was harvested at 72 h. The cell pellets thus obtained were washed twice with PBS (Phosphate buffer saline, pH 7.4). Then fixed in ethanol: acetic acid (1:3) for 10 min, again washed with PBS and finally stained with Nile red (10gL-1) for 5 min. For mounting on glass slides prior to visualization, immobilization was done by mixing with 1% low melting agarose in 1:1 ratio. This leads us to proceed towards the visualisation under the microscope using epifluorescence (Zeiss HBO 100 fluorescence microscope) for the presence of PHA within the cells as indicated by the intensity of Nile-red orange fluorescence measured at 560 nm excitation and 590 nm emission wavelengths. On the basis of Fluor metric visualization the selected strain showed fluorescence and it was selected for PHA production. Spectrofluorometric Observation: Accumulated PHA within the bacterial cells was observed spectrofluorometrically with Nile red following a modification in the procedure described by . Bacillus sp. was cultured in MM with 0.5% glucose. It was then incubated under aerobic conditions at 30°C and 150 rpm for 7 days. Fluorescence of bacterial culture was measured after staining with 10 μg/ml Nile red at 488 nm excitation wavelength, 575 nm and 590 nm emission wavelengths for PHA, every 24 h with 0 h taken as control. Indication of the presence of PHA within the cells was shown by the intensity of Nile-red orange fluorescence which was measured using Shimadzu RF- 5301 PC Spectrofluorophotometer. Simultaneously, the growth of bacterial cells expressed as optical density (O.D.) at 595 nm on Cary 100 BIO UV-Visible Spectrophotometer was also recorded. Determination of bacterial biomass, extraction and calculation of PHA weight in cells: Bacillus sp. was cultured in MM with 0.5% glucose. It was then incubated under aerobic conditions at 30°C and 150 rpm and harvested after 3 days (72 h). After centrifugation (8000 rpm, 15 min. ), cell biomass expressed as cell dry weight per 100 mL of culture broth, was determined, washing (with MilliQ water) and oven drying (60°C, 24 h) followed by weighing of dry pellets. For PHA isolation, the biomass (lyophilized cells) was treated with chloroform as mentioned during the confirmatory analysis. The hexane precipitated and dried sample were weighed to determine the PHA yield in grams per gram bacterial dry weight. GC-MS analysis: While studying the PHA content of the bacterial strain, the lyophilized and dried cells were processed according to . The dried cells were initially subjected to methanolysis in the presence of methanol (1.7 ml), 98% sulfuric acid (0.3 ml), and chloroform (2.0 ml) at 100°C for 140 min. It was followed by the addition of 1.0 ml of water to the reaction mixture for phase separation. Out of the layering, the lower organic layer was used for Gas chromatographic mass spectrometry (GC– MS) analysis on Shimadzu GC–MS-QP 2010 Plus equipped with a capillary column Rtx-5MS (dimensions: 0.25 micrometer film thickness, 0.25 mm ID, 30 m in length). 1 μl of the sample in chloroform was injected into GC–MS injector port and conditions were set with slight modifications: initial temperature 60°C for 3 min; temperature increased from 60 to 320°C at a rate of 12°C per min, hold time: 8 min). Before using the data further, Data were matched with the GC–MS inbuilt standard mass spectra library of NIST-05 and Wiley-8. FT-IR analysis: Bacillus sp. was first cultured in MM with 0.5% glucose. After 72 h the culture was harvested and the collected cells were washed with MilliQ water and lyophilized. The accumulated PHAs were extracted from the dried cells with chloroform for 72 h at 70°C and then precipitated with 10 volumes of hexane which was air dried and weighed . Fourier Transform Infrared Spectroscopy (FT-IR) was used to record the PHA spectrum of the dried sample using Varian 7000 FT-IR spectrometer (Perkin-Elmer Inc., Wellesley, MA, USA) at room temperature (27°C). A paste of 0.01 g of the dried sample remaining after hexane precipitation was prepared in a ratio of 5:100 with KBr and the spectrum was read in the range of 400–4000 cm-1, applied for 64 scans per sample at 4 cm-1 resolution. Transmission electron microscopy (TEM): The bacterial culture of 72 h in MM was taken and then fixed by chilling to 4°C. It was immediately followed by addition of glutaraldehyde (2.5%). Then washed with PBS buffer (0.1 M, pH 7.2) and further fixed using 1% aqueous osmium tetraoxide (as secondary fixative) for 2 h at room temperature. Dehydration for the samples was performed with a graded series of acetone (50%, 70%, 90% and 100%) with incubation of 2 h at each concentration, except for the 70% ethanol, which was performed overnight. Samples were infiltrated with an araldite mixture CY212 (TAAB Laboratories Equipment, Berks, and United Kingdom). Ultrathin sections were cut with a glass knife, counterstained with 2% uranyl acetate and 0.2% lead acetate and examined in a TEM (2100F, JEOL, Tokyo, Japan) at an acceleration voltage of 120 kV. Culture conditions for optimization experiments: The optimization experiments were performed with Bacillus sp. ISTC1, pre-cultured in LB and inoculated in 250 mL Erlenmeyer flasks under aerobic conditions, with 100 ml of MM at 30°C and 150 rpm for 72 h and were supplemented with % Glucose concentration (0.25, 0.50 and 1.00), pH ranges (4,7 and 10) and harvested at three different time periods (1st, 3rd, 5th day) as per experimental design. Based on the previous and continuously repeated experiments carried out on the bacterial strain, the ranges and levels of the three variables were selected. Both weight of PHA and biomass, were taken as response, with PHA as priority. The weight of PHA and biomass were calculated as previously described in section of methods (analysis of PHA). Box–Behnken design and statistical analysis: Optimization of the glucose concentration, the perfect harvesting time and pH for maximum PHA and biomass yield of Bacillus sp. was done using Box-Behnken design (BBD) of Response Surface Methodology (RSM) with the help of Design Expert 10 (Stat- Ease Inc., Minneapolis, USA). A set of 17 experiments were carried to evaluate the effects of the three variables viz., % glucose concentration, pH and harvesting time period, each with three different concentration levels low (-1), medium (0) and high (+1) on two responses, weight of PHA and biomass both measured in grams (g) per 100 mL culture. The experimental design matrix derived from the Box-Behnken model with the coded minimum, medium and maximum levels of the three variables and their actual values chosen for 17 different experimental sets has been shown in Table 1. The BBD model for predicting the optimal conditions can be expressed in the form of a second order polynomial equation as fo llows:Y=βo+Σβixi+Σβijxixj+Σβiixii2+ὲ where, βo, βi, βij are regression coefficients for the intercept, linear and interactions among different factors, respectively. Y is the predicted response; xi and xj are independent factors in coded units and ὲ is the random error term [15,16]. Analysis of Variance (ANOVA) was used to determine the statistical parameters. The coefficient of regression (R2) was calculated to find out the goodness of fit of the model. Significance of the model terms and equation was evaluated using F-test. Three dimensional response surface plots were obtained to visualize the individual and interactive effects of factors on the two responses as shown. The level of each factor was optimized for maximum response generation by using the numerical optimization desirability function. Experiments were performed (in duplicate) at the predicted conditions and the validation of the model was checked by comparing the results with the model’s predicted values. Table 1: Box –Behnken design of independent variables for process optimization. Factor 1A: Glucose conc. (%). In the present study, bacterial strain was isolated from marble rocks of the palaeoproterozoic metasediments of the Aravali Supergroup, Rajasthan, India, for isolation of oleaginous bacteria for PHA production. The bacterial strain (C1) showing higher optical density was selected for 16S rDNA sequencing. The resulting sequence was entered into the BLAST nucleotide search program of the National Center for Biotechnology Information to obtain closely related phylogenetic sequences indicating similarity of the isolate to Bacillus sp. Pair wise alignment giving closest match was chosen and phylogeny tree was drawn using MEGA 6.1insights to elucidate microbial community. Sequencing of 16S rRNA genes has been very useful for describing the compositions of bacteria Figure 1 shows the phylogeny tree of the strain C1 which showed relatedness with Bacillus sp. It was found that ISTC1, Bacillus sp., was a mesophilic bacterium because it showed significant metabolic activity from temperature range of 25–37°C. 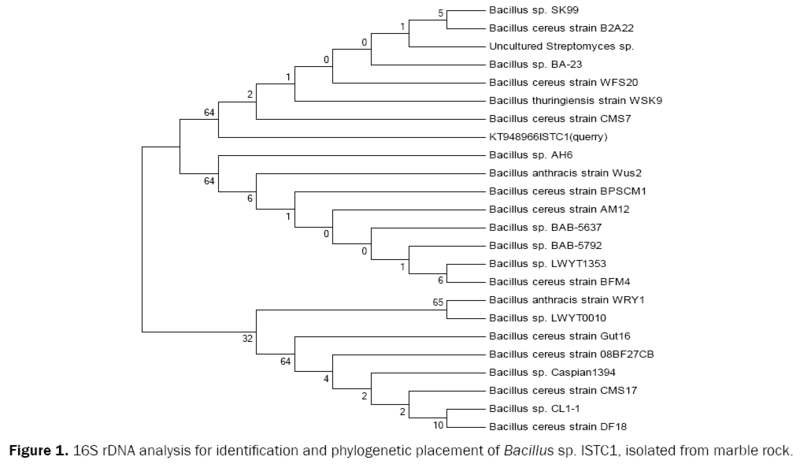 Figure 1: 16S rDNA analysis for identification and phylogenetic placement of Bacillus sp. ISTC1, isolated from marble rock. An isolated bacterial strain Bacillus sp. ISTC1 (gene bank accession number-KT948966) isolated from marble rocks of the palaeoproterozoic metasediments of the Aravali Super group, Rajasthan, was used for the screening and study of PHA production in MM medium (pH 7.5) supplemented with 0.5% Glucose as carbon source and incubated under aerobic conditions at 30°C and 150 rpm for several days. The biosynthesis of PHA and fatty acids or lipids proceed through a common intermediate that is, (R)- 3-hydroxyacyl CoA, resulting from β-oxidation . Research has been conducted on directing the metabolism of microorganisms for the production PHA via fatty acid pathways . Bacillus sp. a Gram-positive bacteria in the family Enterobacteriaceae, has commercially been used for the production of various enzymes, biosurfactants, bioplastics, and antioxidants  showed about 50% of cell dry weight accumulation of PHB in sp. of this class. On the basis of such work and some results in the positive direction, we proceeded with our selected Bacillus sp. ISTC1. 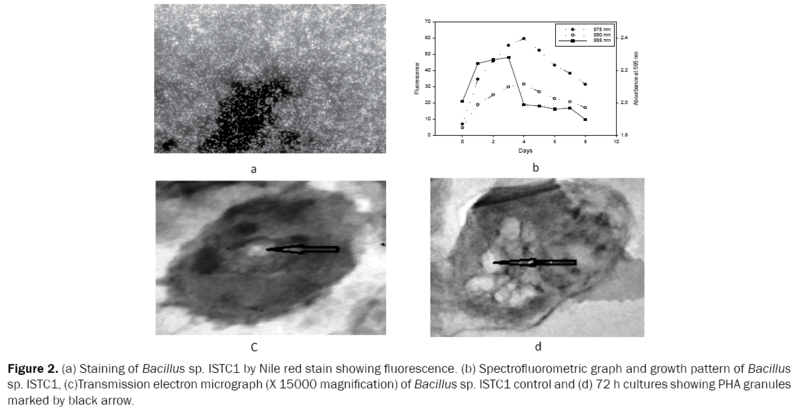 Fluorescence microscopic visualization of PHA production: Nile red fluorescence microscopy was used for the screening of the selected bacterial strain for PHA and lipid accumulation at 560 nm and 590 nm excitation and emission wavelengths, respectively. The Nile red stained and low melting agar fixed bacterial cell were found to show a strong fluorescence after 72 h incubation in MM with 0.5% Glucose as carbon source. The bacterial strain showed fluorescence Figure 2a using Nile red stain and it was further proceeded with, for PHA analysis. Nile red (9-diethylamino-5H benzo [a] phenoxazine-5-one) is a lipophilic fluorescent dye and is often used to detect the PHA and lipid content of microorganisms such as bacteria and microalgae . Bacteria synthesize and store PHA and lipids as insoluble inclusions as reserve food material within their cells in the presence of abundant carbon sources and nutrient limiting condition , particularly nitrogen, which suppress the production of PHA. Binding of Nile red with these lipid and polymeric granules within the bacterial cells gives fluorescence at particular wavelengths. Thus, the presence of lipid granules within the bacterial strain was confirmed by Nile red fluorescence. Figure 2: (a) Staining of Bacillus sp. ISTC1 by Nile red stain showing fluorescence. (b) Spectrofluorometric graph and growth pattern of Bacillus sp. ISTC1, (c)Transmission electron micrograph (X 15000 magnification) of Bacillus sp. ISTC1 control and (d) 72 h cultures showing PHA granules marked by black arrow. Spectrofluorometric analysis of PHA accumulation: Spectrofluorometric monitoring of Bacillus sp. ISTC1 culture in MM, was done with Nile red dye for PHA and lipid accumulation for 8 days. Simultaneous growth measurement of the bacterial culture was also performed by measuring absorbance at 600 nm using spectrophotometer. Figure 2b shows the fluorescence at 575 nm and 590 nm along with growth curve. Maximum fluorescence was observed on 3rd day at 575 nm while bacterial growth attained stationary phase within 1 day. A gradual decline in fluorescence was accompanied by a sharp decline in growth after 3rd day. Lesser fluorescence was observed at 590 nm than at 575 nm on all days. It can be inferred from the results that the strain showed maximum accumulation of PHA and lipids after 72 h. There is a rapid fall in bacterial growth in batch cultures with depletion of carbon sources. During such starving conditions, PHA serves as a carbon and energy reserve and is rapidly oxidized to retard the degradation of cellular components, thus increasing strain survivability under adverse conditions . This possibly explains a gradual decline in fluorescence as compared to a sharp dip in bacterial growth after 3rd day of incubation. Nile red is a metachromatic dye and shows orange red fluorescence in hydrophobic environments. The dye is a commonly used vital stain for detection of intracellular lipids and PHA at an excitation wavelength of 488 nm and emission spectra ranging from 570 to 595 nm . The initial gradual detection of fluorescence at the two wavelengths with time may be related to the cellular permeability of the Nile red dye as well as to the size of lipid and polymer granules within the bacterial cells . 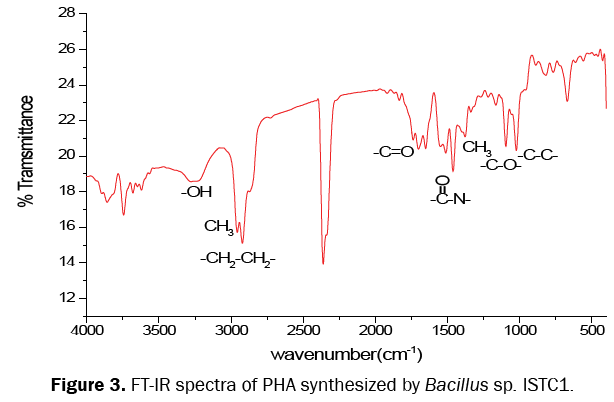 Figure 3: FT-IR spectra of PHA synthesized by Bacillus sp. ISTC1. GC–MS analysis of PHA and lipids: The in situ transesterified samples of Bacillus sp. ISTC1, in the GC–MS profile depicted the presence of PHA, 3-hydroxyvalerate (RT 16.35) and Fatty Acid Methyl Esters (FAMES) such as Hexadecanoic acid, methyl ester, Pentanoic acid,Cyclopentaneundecanoic acid, methyl ester, 13-Docosenoic acid, methyl ester, Eicosanoic acid, methyl ester within the cells. The results also confirm that bacterial production of 3- hydroxyvalerate, a monomeric unit of poly (3- hydroxyvalerate) (PHV) which is a non-PHB homopolymer of medium chain length (mcl-PHA). There have several reports of production of PHB from bacteria. While, 3- hydroxybutanoic acid provides stiffness, 3-hydroxypentanoic acid promotes flexibility to the back bone of the polymer, which is made up of carbon and oxygen atoms. PHV has also been shown to form solution-grown single crystals which have a distinctive crystal and lamellar structure  of Bacillus sp (Figure 4). 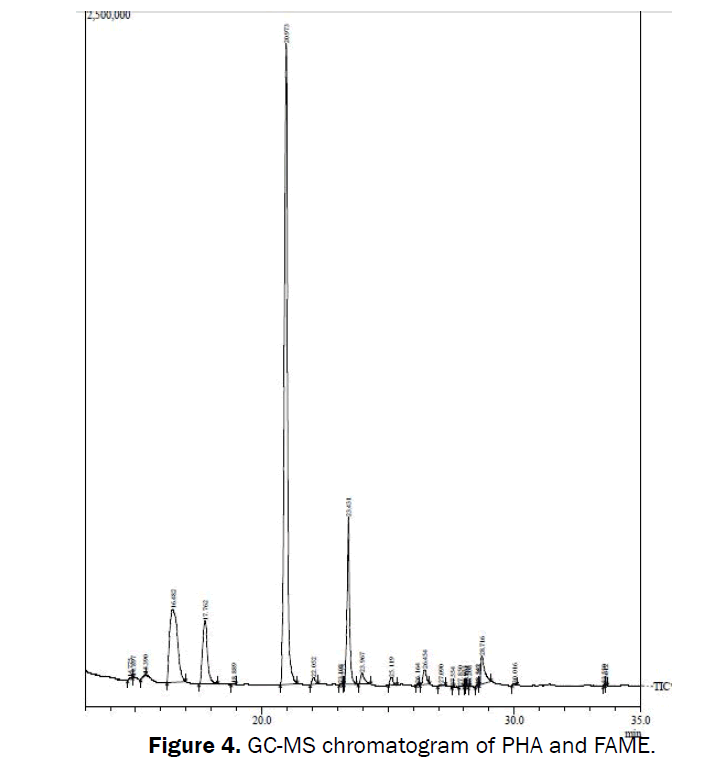 Figure 4: GC-MS chromatogram of PHA and FAME. Analysis of PHA by FT-IR: Non-destructive attenuated total reflectance FT-IR was carried out of the hexane precipitated PHA sample. The assignment of functional group as shown in Table 3 and 4 was done according to previous reports [14,25,26]. The infrared absorption observed at 3420.17 cm-1 was due to the O-H stretching vibration of the hydroxyl group of the polymer chain. Characteristic peaks at 2955.15 cm-1 and 2923.97 cm-1 respectively assigned to asymmetric methyl group (CH3) and asymmetric CH2 of the lateral monomeric chains. The intense peak at 2855.32 cm-1 due to symmetrical methyl group and was possibly a result of the conformational disorder taken place during the crystallization process . The absorption band observed at 1742.11 cm-1 reported to be a PHA marker band has been assigned to the stretching vibration of carbonyl (C=O) ester bond. The bands observed at 1659.11 and 1459.39 cm-1 been assigned to the stretching vibrations of bacterial intracellular amide (-CO-N-) I and II, respectively. Absorption at 1376.163 cm-1 and 1260.32 cm-1 was assigned to terminal CH3 groups and asymmetric C-O-C stretching vibration respectively. Several absorption bands observed from 1167.72 cm-1 to 619.137 cm-1 were assigned to C-O and C-C stretching vibration. Therefore, the precipitated material is established as PHA by the peaks. Table 2: Weight of PHA and Biomass (g per 100 mL culture) before and after Optimization. TEM viewing Of PHA granules within the bacterial cell: Transmission electron microscopic studies performed on both controls and 72 h culture cells indicated a higher accumulation of PHA granules within the bacterial cells in the 72 h sample. The results further confirm the production of PHA by the strain. Similar images for visualization of PHA granules within the bacterial cells have been shown by [2,28]. There is coating of phospholipids and proteins monolayer over these granules and the associated proteins are involved in the formation of granule and in the synthesis and degradation of PHA. The role of individual factors and their double interactions on the response is revealed by comparing the factor coefficients in the coded equations. Positive coefficient values indicate that individual or double interaction factors positively affect the response, whereas the negative coefficient values indicate that the factors decrease the response in the tested range. The coefficient values in Eqs. (1) and (2) reveal that the weight of PHA increase with increase in all the three factors–Glucose, duration and pH but the weight of biomass decrease with increase in–Glucose, duration while increase with increase in third parameter pH. The combined interaction of Glucose concentration and pH had a negative effect on both the weight of PHA and on the biomass, while of the collective effect of pH and Time duration, and Glucose concentration and time duration had a positive and negative effect on PHA and biomass responses respectively. Analysis of Variance (ANOVA) was used to define the adequacy of the model. The model F-value of 163.17 for weight of PHA and 63.93 for biomass by Bacillus sp. ISTC1 implies that the model is significant. The chance of a larger F-value occurring due to noise is only a 0.01%. The ‘‘Lack of Fit F value’’ of 11.26 and 3.50 for weight of PHA and biomass respectively, implies that that a Lack of fit is not significant relative to the pure error. The R2 coefficient provides the proportion of the total variation in the response predicted by the model, certifying a satisfactory adjustment of the quadratic model to the experimental data. A high R2 value close to 1 is preferable and a reasonable agreement with adjusted R2 is necessary. Adeq Precision” measures for the weight of PHA and biomass respectively, indicates an adequate signal. This model can be used to navigate the design space as per the model. The coefficient of variance (CV) is the ratio of standard error of estimate to the mean value of the response. It describes the duplicability of the model. A model is normally considered reproducible if its CV % is not greater than 10. The values of CV % are 5.39 and 2.16 for weight of PHA and biomass respectively. So, the reproducibility of the model is confirmed by the fact that both the values are less than 10. Three-dimensional graphical responses were generated on the basis of the model equations to study the interactive effects of the three factors on the two responses. The response surface plots for weight of PHA and biomass are shown in Figure 5. These plots depict the relative effects of any two factors while keeping the third factor constant. In case of weight of PHA, efficiency was found to increase up to pH 8 followed by a decline with further increase in pH while it showed increase up to intermediate concentrations of glucose after which there was a decline (Figure 5b). However, for biomass, with more acidic pH, there was a sharp decrease but with increasing concentration of glucose, there was a marginal decline of biomass (Figure 5e), this figure shows the interactive effects of duration and glucose concentration on the weight of PHA and suggests that values near to the intermediate points have the most positive effect and there is a little flatness at higher concentration. According to Figure 5f, interactive effect of duration and glucose concentration for biomass yield is nearly similar to that of PHA. Nevertheless, maximum biomass is observed at a middle duration while there is a gradual decline in biomass with increasing glucose concentration. The influence of time duration along with pH showed intermediate values as best on both the responses. Weight of PHA and biomass showed maximum value at middle duration while a there was a sharp decline above and below pH 8 (Figures 5a,5c,5d and 5e). Thus, these plots suggest that pH plays a very crucial role in higher response generation while Glucose concentration has a moderate effect. Slightly alkaline pH, nearly 3 day duration and intermediate Glucose concentration have positive effects on both weight of PHA and biomass. The results, thus, confirm the PHA production by Bacillus sp. ISTC1. Figure 5: 3-D surface plot showing the interaction of A=Glucose concentration (%), B =Durationand C=pH on weight of (i) PHA (a,b,c) and (ii) biomass (d,e,f), both measured in g per 100 mL culture by Bacillus sp. ISTC1. Verification experiments with numerical optimized levels of experimental variables were conducted in order to confirm the suitability of Equation. (1) and (2) for maximum response generation (Tables 2). The optimized conditions as predicted by the software for maximum PHA and biomass production were 0.6771% Glucose concentration, 3.6223 days duration and at p H 7.67702 and the predicted production of PHA and biomass were 0.08244 g and 0.1653 g per 100 mL culture respectively at desirability 0.943. The weight of PHA and biomass attained after validation experiment at the predicted conditions were found to be 0.08119 g and 0.1675 g per 100 mL culture respectively. Thus, the results of the verification experiments established the accuracy of the predicted model. The weight of PHA and biomass (per 100 mL culture) prior to optimization, at the initial experimental conditions of 0.5% Glucose at pH 7.5 harvested after 3 days were found to be 0.0511 and 0.1456 g respectively. Thus, after optimization of the glucose concentration, time duration and pH, the production of PHA and biomass was increase almost 60% (0.081 g) and 15% (0.167 g) per 100 mL culture respectively. Gram negative bacteria, Cupriavidus necator, Alcaligenes latus and recombinant Escherichia coli, have been used for production of PHA in an industrial scale, however, Gram positive bacteria, Bacillus megaterium SW1-2, which can use cheaper raw materials for PHA to be used for biomedical applications . Bacillus spp. have been reported to accumulate 9 to 67% (cell dry weight) of PHA when grown on different substrate . Steinbüchel et al. first reported production of PHV by Chromobacterium violaceum. The strain was found to produce 2.48 g per 100 mL PHV from a 300 L scale fed-batch fermentor . Fukui et al. reported production of PHV (0.002 g/100 ml dry biomass) from a recombinant R. eutropha PHB-4, however, an oleaginous bacteria, Serratia sp. ISTD04, was found to produce 0.082 g PHV per 100 mL of cell dry weight . In another study, production of homopolymer poly (3-hydroxyvalerate) (PHV) by a recombinant Aeromonas hydrophila strain 4AK4 in shake flasks was reported to be 0.27 g per 100 mL of cell dry weight . The models for biomass and PHA production was adequate enough as depicted from the high F-values (63.93 and 163.17 respectively) and insignificant lack of fit (probability F=3.50 and F=4.37 respectively). In addition, the determination coefficients (R2) were closed to unity, 0.9697 and 0.9821 respectively for biomass and PHA production. This indicates that the models explain about 96.97 and 98.21% respectively of the variations of the responses. The 3D response surface and 2D contour plots depicted the variation in biomass and PHA production as a function of interaction of variables (Figure 5). From this figure it is concluded that increasing C/N ratio and phosphate concentrations resulted into rise of biomass production as a function of time. Table 3: Peaks observed in FT-IR spectrum and their corresponding annotations. Table 4: GC-MS data table for PHA and FAMES. Regarding PHA production, the elliptical nature of the contour plots demonstrates that the interactions amongst the three variables have significant impact on the polymer accumulation. PHA produced by Bacillus sp. ISTDC1, which is 49% of cell dry weight by using low concentration of glucose . In order to reduce the overall cost, PHA with high productivity and high yield is required; therefore, optimization of process was adopted in this study to reduce the cost. In earlier research, PHA production was enhanced due to interaction between glucose with ammonium sulphate in B. megaterium OU303A, B. cereus SPV and B. thuringienesis IAM12077, whereas in B. megaterium NCIM and B. megaterium SRKP-3 PHA production was not increased . Although, the amount of PHV produced by Bacillus sp. ISTC1 in this study is not at par with some of the previous reports on other bacteria, yet the optimize production of PHV using only mineral media with low concentration of carbon source like glucose makes the finding important for production of PHA granules in the bacterial cells which can further be harvested to make bioplastics and other composites at low cost. The present work involve in production and optimization of homopolymer poly (3-hydroxyvalerate) (PHV), a type of mcl- PHA by Bacillus sp. The GC-MS results confirmed the production of 3- Hydroxyvalerate, which is a monomer of PHV, by Bacillus sp. ISTC1 cultured in a mineral media supplemented with glucose as carbon sources. A 60% increase in PHA production after optimization demonstrates the successful application of the Box-Behnken design of RSM in process optimization for enhanced PHA Production. Authors are thankful to Department of Science and Technology (DST) and University Grants Commission (UGC), New Delhi, Government of India, for Providing Research Fellowship. We thank Madan Kumar for his generous help and support during the experimental work and Dr. Pooja Ghosh for her guidance in RSM data analysis. We also thank Dr. Ajai Kumar, Dr. Manoj Pratap Singh and Dr. Gajendra Saini of Advanced Instrumentation Research Facility, Jawaharlal Nehru University, and New Delhi for GCMS, FT-IR and TEM analysis, respectively. Thakor N, et al. Microbiological and biotechnological aspects of biodegradable plastics:Poly(hydroxyalkanoates). Ind J Biotechnol. 2006;5:137-147. Chaitanya K, et al. Biotechnological production of polyhydroxyalkanoates by various isolates A Review. Int J Pharm Sci Invent. 2014;3:01-11. Noda I, et al. Preparation and properties of a novel class of polyhydroxyalkanoate copolymers. Biomacromolecules. 2005;6:580-586. Khanna S and Srivastava AK. Recent advances in microbial polyhydroxyalkanoates. Process Biochem. 2005;40:607–619. Zhu C, et al. Production and characterization of poly-3-hydroxybutyrate from biodiesel-glycerol by BurkholderiacepaciaATCC 17759.BiotechnolProg. 2010;26:424-430. Hong C, et al.Process optimization for PHA production by activated sludge using response surface methodology. Biomass Bioenergy. 2009;33:721-727. Kumar M, et al. Biodiesel production from municipal secondary sludge. Bioresour Technol. 2016;216:165-171. Kim BS. Production of poly(3-hydroxybutyrate) from inexpensive substrates. Enzyme Microb Technol. 2000;27:774-777. Hoseinabadi A, et al. Isolation and Identification of Poly Î²-Hydroxybutyrate Over-Producing Bacteria and Optimization of Production Medium. Jundishapur J Microbiol. 2015;8:e16965. Numata K, et al. Synthesis of poly- and oligo (hydroxyalkanoate) by deep-sea bacteria, Colwelliaspp, Moritellaspp and Shewanella spp. Polym J. 2013;45:1094-1100. JaiswalPK, et al. Isolation and characterization of alkalotolerant Pseudomonas sp. strain ISTDF1 for degradation of dibenzofuran. J IndMicrobiolBiotechnol. 2011;38:503-511. Berlanga M, et al. Rapid spectrofluorometric screening of poly-hydroxyalkanoate-producing bacteria from microbial mats. IntMicrobiol. 2006;9:95-102. Kimura K, et al. Rapid estimation of lipids in oleaginous fungi and yeasts using Nile red fluorescence. J Microbiol Methods. 2004;56:331-338. Numata K, et al.Synthesis of poly- and oligo (hydroxyalkanoate)s by deep-sea bacteria, Colwelliaspp, Moritellaspp and Shewanella spp. Polym J. 45:1094-1100. Ghosh P, et al. Enhanced removal of COD and color from landfill leachate in a sequential bioreactor. Bioresour Technol. 2014;170:10-19. Kumar M, et al. Carbon dioxide sequestration by chemolithotrophic oleaginous bacteria for production and optimization of polyhydroxyalkanoate. Bioresour Technol. 2016;213:249-256. Ren Q, et al. An NADPH dependent 3- ketoacyl reductase of Pseudomonas aeruginosa, provides precursors for mediumchain- length poly-3 hydroxyalkanoate biosynthesis in Escherichia coli. J Bacteriol. 2000;182:2978-2981. Magdouli S, et al. How to direct the fatty acid biosynthesis towards polyhydroxyalkanoates production? Biomass Bioenergy. 2015;74: 268–279. Lugg H, et al. Polyhydroxybutyrate accumulation by a Serratia sp. BiotechnolLett. 2008;30:481-491. Zuriani R, et al. A high throughput Nile red fluorescence method for rapid quantification of intracellular bacterial polyhydroxyalkanoates. Biotechnol Bioprocess Eng. 2013;18:472-478. Lee SJ, et al. Rapid method for the determination of lipid from the green alga Botryococcusbraunii. Biotechnol Tech.1998;12:553-556. Cooksey KE, et al.Fluorometric determination of the neutral lipid content of microalgal cells using Nile red. J Microbiol Methods. 1987;6:333-345. Iwata T, et al.Single crystal morphologies of biodegradable aliphatic polyesters. RIKEN Review Focused on Ecomolecular Science Research No. 2001;42:15-18. Gumel AM, et al. Biosynthesis and characterization of polyhydroxyalkanoates copolymers produced by Pseudomonas putida Bet001 isolated from palm oil mill effluent. PLoS One. 2012;7:e45214. Mohapatra S, et al. Phylogenetic heterogeneity of the rhizospheric soil bacterial isolates producing PHAs revealed by comparative analysis of 16s-rRNA. Int JCurrMicrobiolAppl Sci. 2014;3:680–690. López-Cuellar MR, et al. Production of polyhydroxyalkanoates (PHAs) with canola oil as carbon source. Int J BiolMacromol. 2011;48:74-80. Poblete-Castro I, et al. Comparison of mcl-poly (3-hydroxyalkanoates) synthesis by different Pseudomonas putida strains from crude glycerol: citrate accumulates at high titer under PHA producing conditions. BMC Biotechnol. 2014;14: 962. Berekka MM and Al Thawadi AM.Biosynthesis of polyhydroxybutyrate (PHB) biopolymer by Bacillus megaterium SW1-2: Application of Box-Behnken design for optimization of process parameters. Afr J Microbiol Res. 2012;6:838-845. Steinbüchel A, et al.Synthesis and production of poly (3-hydroxyvaleric acid) homopolyester by Chromobacteriumviolaceum. ApplMicrobiolBiotechnol. 1993;39:443-449. Steinbüchel A andSchmack G. Large-Scale production of poly (3-hydroxyvaleric Acid) by fermentation of Chromobacteriumviolaceum, processing, and characterization of the homopolyester. J Environ PolymDegr. 1995;3:243-258. Fukui S, et al.Distribution of referred pain from the lumbar zygapophyseal joints and dorsal rami. Clin J Pain. 1997;13:303-307. ShenXW, et al. Production and characterization of homopolymerpoly(3-hydroxyvalerate) (PHV) accumulated by wild type and recombinant Aeromonashydrophila strain 4AK4. Bioresour Technol. 2009;100:4296-4299. Munir S, et al. Characterization of polyhydroxyalkanoates produced by contaminated soil bacteria using wastewater and glucose as carbon sources. Trop J Pharmaceu Res. 2015;14:1605-1611.